The Alex Dumas Limited edition was issued in 1996, 150 years after the first translations of Dumas’ best remembered historical novels: The Three Musketeers and The Count of Monte-Cristo. 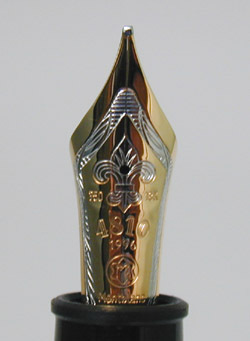 The cap is adorned with gold-plated fittings and due to a research error, Montblanc produced a small number of pens with the signature of his son, also named Alexandre. 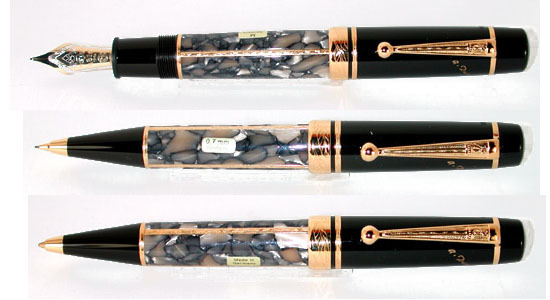 Mont blanc recalled all unsold pens bearing the incorrect signature however some were still sold. This is an extremely rare set. The design of the pen incorporates subtle references to his works including a clip in the form of a sword and the cap ring adorned with a French lily. One thing neat about this piece is that the fountain pen comes with a huge nib (same size as on the 149 Diplomat size pens), larger than all the other Writer Series nibs (except the Hemingway.) Note: Quantities on the version with the wrong signature are unknown but believed to be close to those of the correct signature (although somewhat less).